An office or home renovation takes in a lot of effort, shopping, and budgeting. To manage all that you don’ just need manpower and some helping hands, but better organized planning. The better you plan it from the scratch, the nicer you would be close to the goal. If you make a checklist of all items you need to buy, all items you need to remove, or repair and such things, then the job will be easier for you. 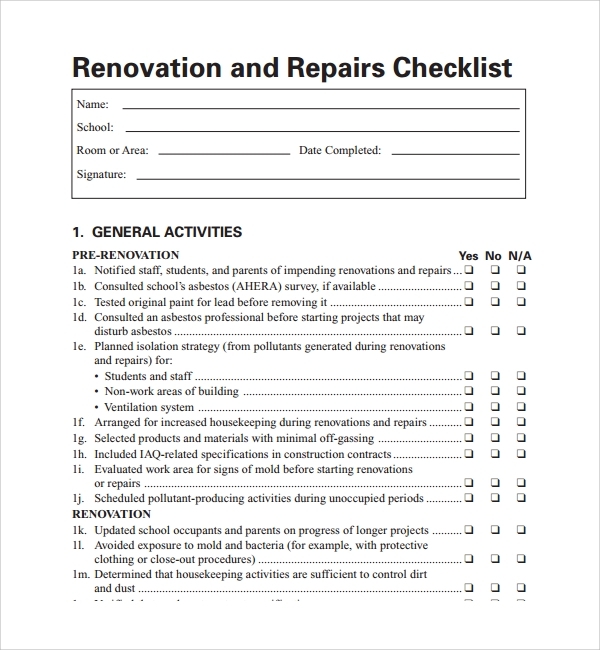 Thankfully Beach Checklist Template of such Renovation Checklist area available for download online, and you can download one and straight away start following the points to achieve better results. 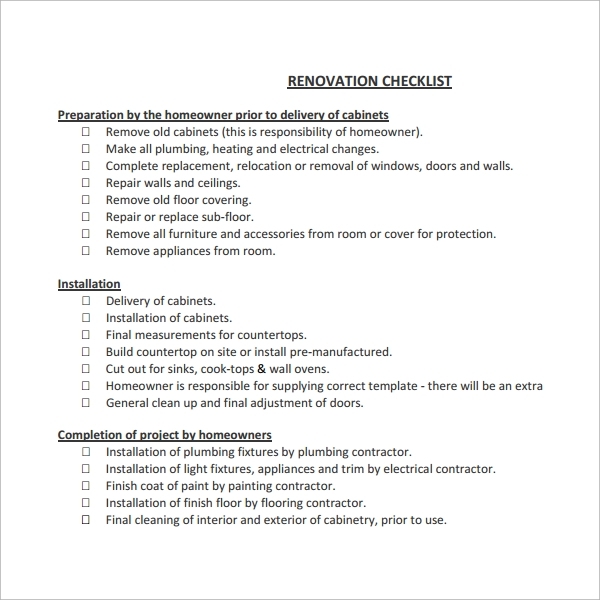 A house renovation checklist is one where you plan it for the house only. You make plans of renovations, and list all items which you think are important in the first place for repair, buying etc. If you are on a tight budget, the same list helps you prioritize the needs and plan accordingly. 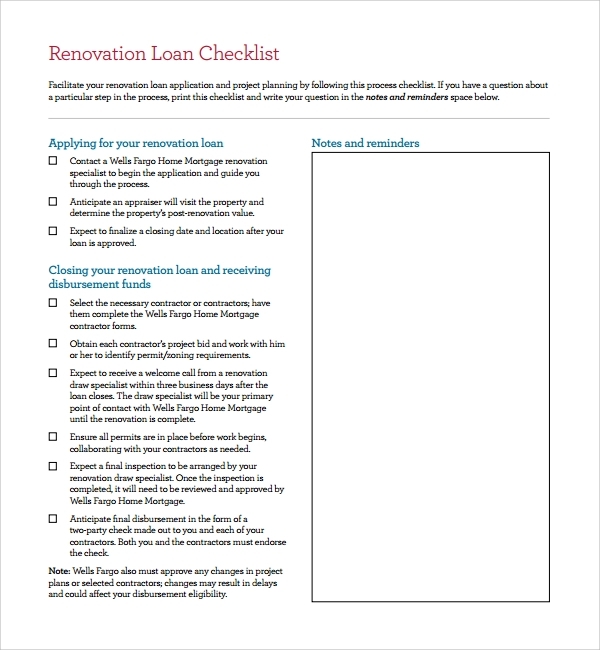 Get a copy of this checklist template online, and save yourself some time as you concentrate on the house renovation. 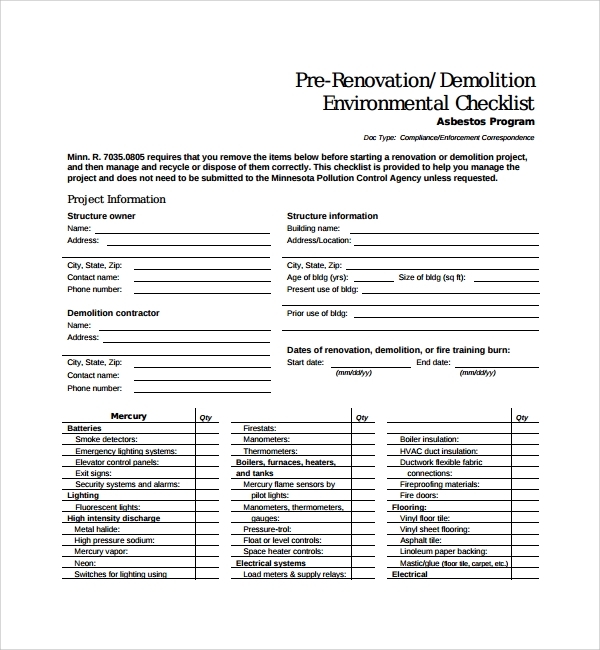 The office renovation checklist is similar to the house one, with the difference of more office supplies and items on it. 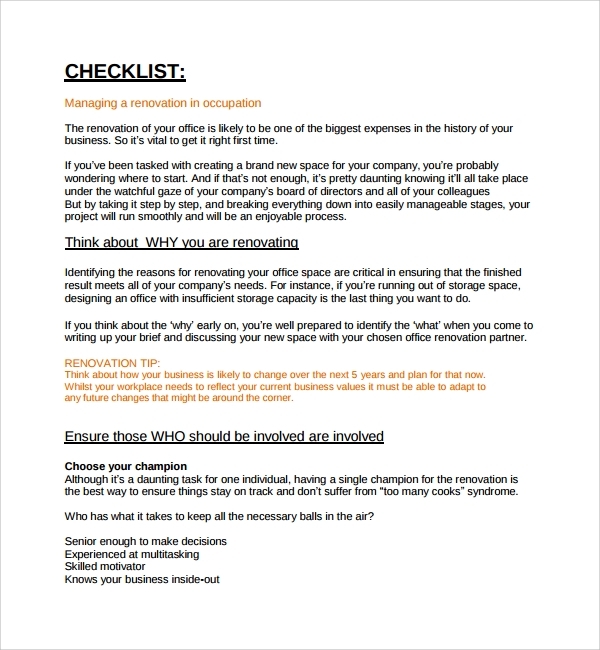 The customized and office specific checklist template which you get online can be downloaded and personalized by you to plan the office renovation better without missing any crucial point. So many points can cloud and clutter the head when you are re-planning the kitchen. The kitchen renovation is not just time consuming and costly, but also quite hefty. 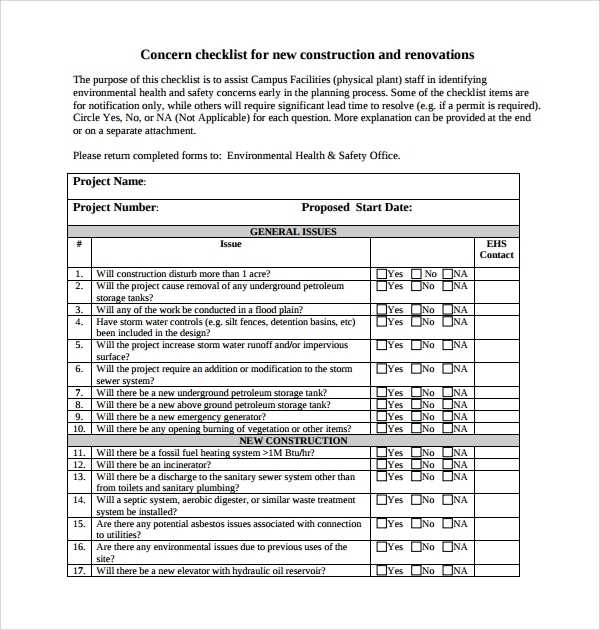 The checklist saves you a lot of energy as you stop thinking the crucial points, and just jump into working with the already prepared template form. The free templates always look attractive, as you never invest your time and energy, and in this case not your money also. 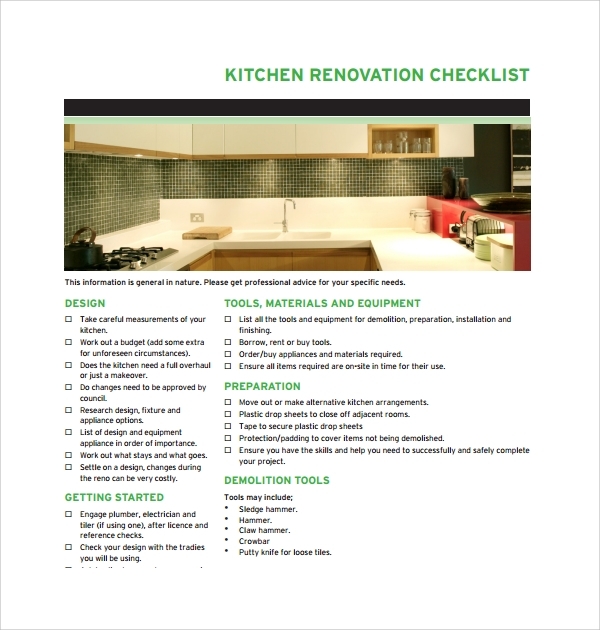 You can enjoy a remodel without half of the headache when you get the remodeling checklist template free for download. The same is made available via online rich resources. 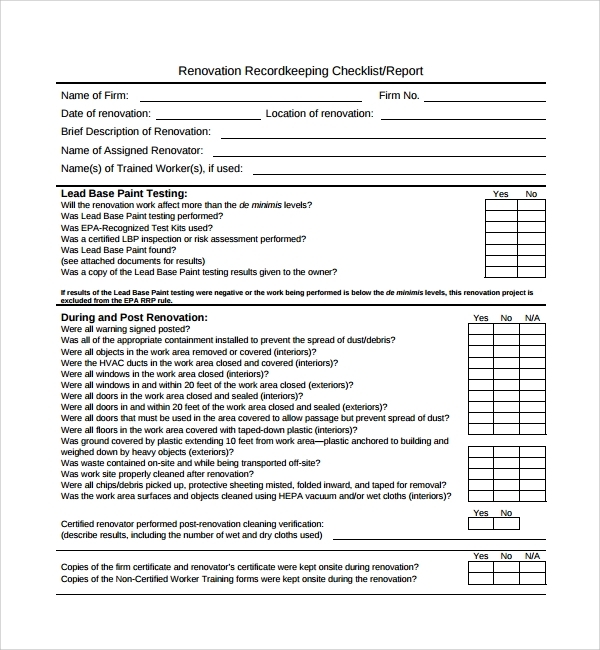 Renovation checklist templates, Due Diligence Checklist Template are useful for several reasons. When you are planning to renovate the home or office, you have no idea, how clueless you feel at times; when you realize that you have missed a big point. It’s not only about buying things or selling or repairing items. It’s about appointing the labor or carpenter, the painters etc. It’s about getting certain tools handy, and about talking to people for suggestions too. There is a lot of thing and task, which will definitely miss out of your head, if you are not guided by the well patterned checklist. Thus the role of the templates gets evident, which supplies you with the already summoned up general points for the job. Just as you decide that you are prepared to renovate, you will first have to decide on the budget. The budget is the key to everything, as this will only decide if you are actually ready for the renovation or not. If you can afford it, you will realize that you carry with your renovation plans or may have to wait otherwise. 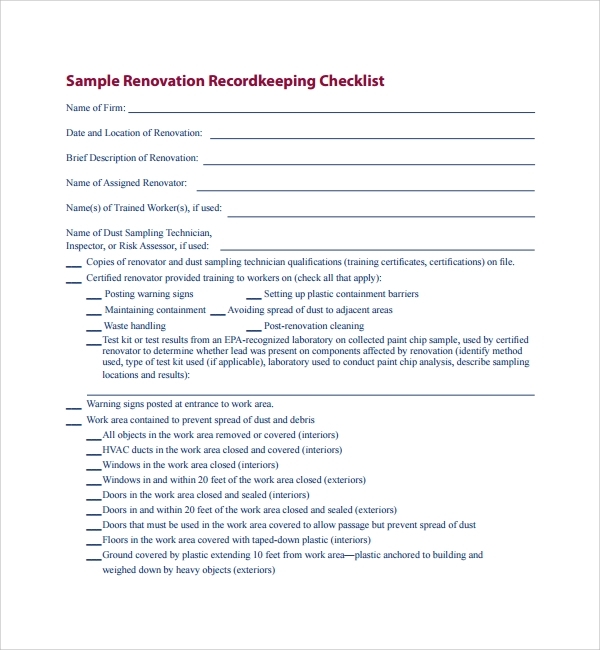 It is this point of time, that you will need the renovation checklist template, Wedding Checklist Template. Once you tally things with the template, you will be able to get the idea of budget and cost, and then you can really start the planning. Checklists are crucial in planning as you are saved of missing small ad big points when you are ready with a checklist to accomplish a job. 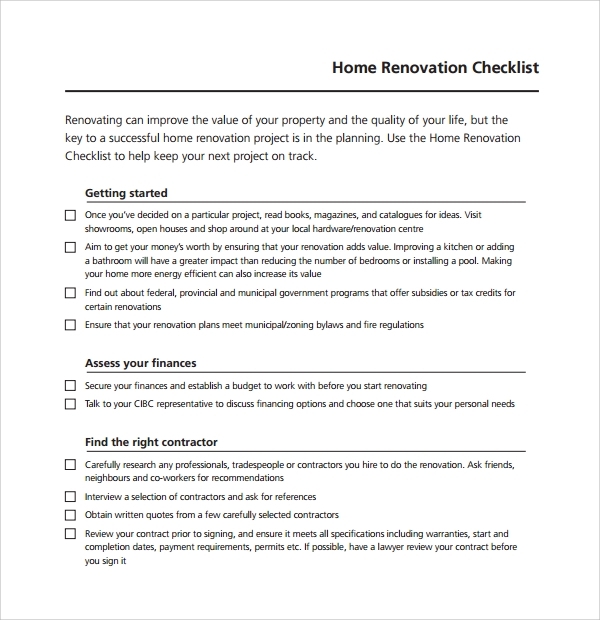 When it comes to a serious responsibility and task like remodeling, you are nowhere close to success without a proper checklist. The templates you get online for download or to make your path smoother while you can always add in your points, or remove some.